As mentioned in the weekly update (below), relief efforts are underway between the Vanuatu National Disaster Management, the Vanuatu Government, the Vanuatu Red Cross, Air Vanuatu, and others to permanently evacuate the island of Ambae after another increase in eruptive activity from Manaro Voui crater. Of the estimated original population of 10,000 many have already evacuated to neighbouring island,s since the first eruptions in September 2017, including over 1400 people to Maewo and around 3200 people to Luganville on the neighbouring island of Santo just in the first week of August alone. Vulnerable people, including those who are critically ill, pregnant, or elderly were formally evacuated first. The main problem though is that it is not known how many inhabitants are still on the island, much of which is now covered in a thick layer of volcanic ash deposits, making it difficult and hazardous to navigate around. It is precisely these ash deposits from the explosive eruptions of Manaro Voui which have damaged or killed all the crops, contaminated the island's drinking water sources, and caused roofs on buildings to collapse. Nevados de Chillan volcano, which is a popular site in Chile for skiing and other outdoor pursuits, erupted yesterday (9th August 2018). The report issued by SERNAGEOMIN (organisation responsbile for monitoring Chile's volcanoes) states that the eruption column was only reaching heights of around 1 km above the summit area, and intermittantly grey-coloured, indicating ash content in the eruption plume. Ballistics were visible on the ground next to this erupting vent. Incandescence (glow) was visible at night time. Infrasound emissions (soundwaves at frequencies of < 20 Hz, i.e. below the human audible level of hearing) from the explosive activity was detected by sensors. The main concerns, other than people venturing within the defined exclusion zone and getting caught in another explosive eruption at the volcano, is if the heat from this activity melts the snow and ice at the summit, potentially causing lahars downslope. Nevados de Chillan is currently on volcanic alert Orange. Here at Earthquake-Report.com we love to see photos from volcanologists and other scientists on fieldwork. Here are a few images from (PhD student) Bridie Davies, who has just returned from a month of fieldwork on Ascension Island in the South Atlantic Ocean. In 2014 and 2015 respectively, research volcanologists (and our friends) Dr Katie Preece and Dr Katy Chamberlain spent fieldwork seasons geologically mapping the island, which rather unusually has displayed different types of volcanism in the past, from effusive lava flows to more gas-rich, explosive eruptions. The aim of Bridie's fieldwork this year was to take rock samples from some of the locations mapped by Katie and Katy for lab analysis in order to try and determine the evolution of the magma under the island. Doing so is necessary in order to try and understand what caused the changes in eruptive styles on this volcanic island and to determine what kind of activity might occur there again in the future. In the images above, we see Bridie and her PhD co-supervisor digging a pit, which is common in physical volcanology research to look at the successive layers of ash, scoria, and other volcanic products to determine the nature of previous eruptions. Although this volcanic island only has around 880 inhabitants, it provides a strategic airbase, as well as being a site of ecological interest. For those of you interested in volcanology from a research perspective, a new journal launched earlier this month, which is open access (i.e. does not charge for accessing the research articles). The idea for Volcanica came from (volcanologists) Jamie Farquharson and Fabian Wadsworth and was bandied around on Twitter, with much support from other volcanologists. Jamie and Fabian have assembled a team of editors / proof readers / peer reviewers from around the world, including the Earthquake-Report.com's very own former contributor Janine Krippner. Normally it costs researchers or their institutes several hundreds to thousands of dollars to publish their work in scientific journals, and the publishers then also charge readers to access the research papers within those journals. Open access is a win-win way around this, particularly with Volcanica, which has 'Diamond status', i.e. critical impact, which is important to researchers in order to then apply for funding to do further research. According to news articles and the Vanuatu Red Cross, residents of Ambae began to evacuate the island during 1-8 August under the governments orders due to the significant ashfall from the ongoing eruption at Lake Voui. The Red Cross noted that by 8 August over 3,000 people had been moved to Espiritu Santo (W) and Maewo (NE) islands. Video from 3 August showed lahars blocking roads in S Ambae. Based on two field inspections and webcam data, (volcano monitoring agency) INGV reported that during 30 July-5 August activity at Etna was characterized by gas emissions at the summit craters and Strombolian activity. Three vents at the bottom of the Bocca Nuova crater were active, with gas emissions rising from two vents and sporadic Strombolian explosions at the third ejected incandescent material as high as the crater rim. After several months of quiet conditions, explosive activity resumed at the E crater on the E flank of the New Southeast Crater (NSEC). The activity began at 06:08 on 1 August with a brownish-gray ash emission that rose several hundred meters above the summit. The event was followed by more ash emissions and then Strombolian activity in the evening. (Indonesian volcan monitoring agency) PVMBG reported that on 2 August multiple events at Anak Krakatau generated ash plumes that rose as high as 300 m above the summit and drifted N. A dense black ash plume from an event at 17:57 rose 200 m and drifted N. During 5-7 August dense gray ash plumes rose 200-600 m above the summit, and summit incandescence was visible at night. The Alert Level remained at 2 (on a scale of 1-4); residents and visitors were warned not to approach the volcano within 1 km of the crater. Servicio Nacional de Geologia and Mineria (SERNAGEOMIN), Observatorio Volcanologico de Los Andes del Sur (OVDAS) and ONEMI reported continuing activity through 6 August associated with growth of the Gil-Cruz lava dome in Nevados de Chillan's Nicanor Crater. Seismicity was at moderate-to-high levels, and consisted of long-period events and tremor. The Alert Level remained at Orange, the second highest level on a four-colour scale, and residents were reminded not to approach the crater within 3 km. ONEMI maintained an Alert Level Yellow (the middle level on a three-colour scale) for the communities of Pinto, Coihueco and San Fabian. Instituto Geofisico (IG) reported that the eruption at Sierra Negra continued during 1-7 August. Incandescence from active lava flows was visible daily. An increase of tremor began 22:22 on 3 August and lasted two hours, signifying a new pulse of activity on the N flank. Small gas emissions were visible on 4 August, and steam-and-gas emissions were noted on 6 August. Anak Krakatau is currently in a continuous phase of eruption with what looks mostly like Strombolian activity at the summit and lava flows reaching the sea from the flanks on the southern side. The image (below) was taken yesterday (5th August 2018) using a drone-mounted camera, with the operator outside of the 2 km exclusion zone around the island volcano. Fissure 8 continues to erupt lava into the channel leading northeastward from the vent. No overflows were reported this morning (30th July 2018) and lava levels in the channel appear low. At the coast, the south edge of the lava flow has not advanced westward in the past day, and remains less than 175 m (0.1 mi) from the Pohoiki boat ramp in Isaac Hale Park. Lava along the western edge of the flow is fuming and may start oozing from this edge. Lava is actively entering the ocean along a broad 2 km (1.2 mi) flow front centered near the former Ahalanui Beach Park. No other fissures are active this morning (30th July 2018). Magma continues to be supplied to the Lower East Rift Zone. Seismicity remains relatively low although higher amplitude tremor is occasionally being recorded on seismic stations close to the ocean entry. Additional ground cracking and outbreaks of lava in the area of the active fissures are possible at any time. Residents downslope of the region of fissures should remain informed and heed all Hawaii County Civil Defense messages and warnings. Below is the latest volcanic hazard map for the LERZ as of 30th July 2018, showing the current lava flow activity from Fissure 8 in the red and coral colours and historic lava flows in purple. The most recent collapse event occurred at 12:08 p.m. HST July 29, and was similar in character and magnitude to previous events. Seismicity is slowly increasing and has been 25-30 earthquakes per hour this morning. Inward slumping of the rim and walls of Halemaʻumaʻu continues. Last night (29th July 2018) at 10:02 PM, an earthquake on Kilauea's south flank was felt as far north as Hilo by a few people. The magnitude-4.1 (NEIC) earthquake was weaker than recent summit earthquakes but it was felt more widely, possibly due to its greater depth of 7 km (compared with 2 km for summit earthquakes). Sulfur dioxide emissions from the volcano's summit are very low. This gas and minor amounts of ash resuspended by wind are being transported downwind. Small bursts of ash and gas may coincide with the summit collapse events. The summit region is occasionally impacted by sulfur dioxide from the lower East Rift Zone eruption. The two British teams of volcanologists who are currently on Big Island assisting the U.S. Geological Survey in their monitoring efforts have been posting further updates on Twitter. 'Team Plume' - an all-female team of volcanologists, who are trying to determine the sulfur dioxide flux (emissions) rates, have been using different methods, including tripod-based spectrometer, drone-based equipment, and their 'drop and run' mobile unit 'Harry'. They report though that regardless of trying these multiple different methods for sampling the volcanic gases emissions from Fissure 8, the biggest problem that they are currently facing is that the levels are off the scales of their instrumentation. This indicates that the levels of carbon dioxide, sulfur dioxide and other volcanic gases are high in the vicinity of Fissure 8. Thankfully though, these gases are mostly being blown by trade winds away from inhabited areas. The relationship between the levels of the different volcanic gas emissions provides volcanologists with an indication of whether there is a constant stream of new magma rising to the surface or magma which has been underground for a while, degassed, and evolved. So in this case, where the fluxes are so high as to be off this team's instrumentation indicates that there is still very new magma coming through the LERZ on Big Island. 'Team Plume' are also using the volcanic gas sensor up on (neighbouring volcano) Mauna Loa to get an overall sense of the volcanic gas levels across Big Island. A team of volcano seismologists from the University of East Anglia (UK) and Hiroshima University (Japan) are meanwhile currently out in the field assisting the U.S. Geological Survey to install some additional seismometers in the LERZ. Augmenting the seismic network to this area will help the Hawaiian Volcano Observatory to track the location of any new fissures (cracks) which may form. 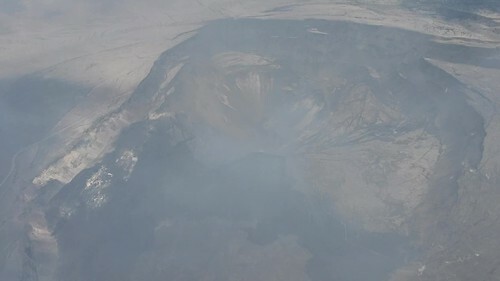 The video footage (below), captured on 28th July 2018, shows activity at Karymsky, which is one of the most active volcanoes in the Kamchatka peninsula. This looks like a steam and ash plume. The aviation code for Karymsky is currently at Orange (the 2nd highest level on a 4-level scale). As you may have heard, a M6.4 Earthquake struck the Indonesian island of Lombok over the weekend. You may also have heard that many climbers were stuck on Mount Rinjani, a volcano on the island, due to landslides caused by the Earthquake blocking the paths down. As of 30th July 2018, 543 people of the estimated 820 people who were on Rinjani at the time have now managed to safely evacuate, including: 189 foreign tourists, 173 local people, 31 guides, and 150 porters. 1. Wisatawan asing 189 orang. 2. Domestik/Lokal : 173 orang. 3. Guide : 31 orang. As of 06:51 a.m. local time today, a joint evacuation team managed to reach 6 more climbers + 1 deceased on Mount Rinjani, all of whom have now been airlifted off the volcano. The search continues for other climbers stuck on Mount Rinjani. INGV reported that during 16-22 July gas plumes rose from Etna’s summit crater; low-energy Strombolian activity also occurred from three vents at the bottom of Northeast Crater (NEC) and from two vents in Bocca Nuova. The activity was mostly confined to the craters, with material falling back into the craters, though occasionally incandescent lava was ejected about 100 m above the crater rim. The activity sometimes generated ash emissions that dissipated near the summit. Based on satellite and wind model data, the Darwin VAAC reported that during 18-20 July ash plumes from Anak Krakatau rose to an altitude of 1.5 km (5,000 ft) a.s.l. and drifted NE, E, SW, and W. The Alert Level remained at 2 (on a scale of 1-4); residents and visitors were warned not to approach the volcano within 1 km of the crater. Based on analysis of satellite images, the Darwin VAAC reported that on 20 July a minor eruption at Semeru generated an ash plume that rose to an altitude of 4.9 km (16,000 ft) a.s.l. and drifted SW.
POVI reported that sometime during mid-morning on 18 July webcam images captured two vapor-and-gas emissions with some ash rising from Villarrica. Between 1100 and 1200 that same day a thermal anomaly (the largest since December 2017) was identified in satellite images. Crater incandescence was visible later that day. An earthquake, possibly a volcano-tectonic signal, was detected at about 0627 on 20 July, a few hours after gas-and-steam emissions decreased. Crater incandescence was visible on 23 July. Temps displayed in gray-scale value. Brightest pixels = hottest. Two teams of volcanologists from the UK are now on Big Island assisting the U.S. Geological Survey (USGS) and Hawaiian Volcano Observatory (HVO) with their monitoring efforts, but from a research perspective. An all-female team have been attempting to get samples of the volcanic gases in order to try and better understand which volcanic gases are in the vog and laze (hydrochloric acid steam created from the hydrothermal reaction as hot lava flows into cool seawater) and in what concentrations, how these gas emissions are transported from the Fissure 8 vent to the rest of the island, and how this is affecting the local air quality. Meanwhile, Dr Jess Johnson and Dr Ricky Herd from the University of East Anglia have just arrived on Big Island to install some additional seismometers in the LERZ area. Good first day of the STAK project in Hawaii. All of our @GuralpSystems seismometers have arrived and good times catching up with @USGSVolcanoes HVO colleagues! We shall report more from them about the STAK project over the coming days. The image (below) of Halema'uma'u Crater was captured yesterday. Not sure if those of you outside of the UK will be able to access this (give it a try and let us know), but this episode of BBC Radio 4 programme 'The Genius of Accidents' features two leading volcanologists talking about how the infamous 1883 eruption of Krakatoa / Krakatau lead to the discovery of the stratosphere (layer of the atmosphere) and jet streams. The eruption was one of the biggest of the past 200 years. A cold summer and amazing sunsets followed as a result of the volcanic ash being lofted up into the stratosphere and blown around the globe, reflecting and refracting sunlight. These sunsets were famously captured by several artists, including in Edvard Munch's 'The Scream'. The best thing about this time of year is being able to get some fantastic views of the volcanoes in Kamchatka (far eastern Russia) via the KVERT webcams. Here at Earthquake-Report.com, it saddens us greatly to hear that 13 people have been injured, including one person who was air-lifted to hospital with a serious pelvic/leg injury, as a result of their tour boat being hit by a lava bomb. Coast guards currently have a 300 m (recommended) seaward exclusion zone from the shoreline at Kapoha, south-eastern Big Island, where lava flows from fissure 8 are currently entering the ocean. As reported by us only yesterday and countless times before, the thermo-chemical reaction of hot lava mixing with cool ocean water can cause secondary volcanic hazards, including littoral explosions, which is exactly what happened in this incident. Although the tour boat operator had been vetted by coast guards, clearly they ventured within 300 m of this stretch of shoreline. This has not been confirmed by monitoring agency SERNAGEOMIN, but another organisation reports that they have observed some activity, including ash emissions, from Villarica volcano in the Pucon area. Meanwhile, monitoring agency SERNAGEOMIN are still concerned about Nevados de Chillan, which is still on orange alert. It is currently winter time in Chile, and Nevados de Chillan is a popular location for skiing and other outdoor pursuits. An eruption at this time of year could cause rapid snow and ice melt, and the biggest concern other than explosivity in the summit area, is therefore the potential for lahars. SERNAGEOMIN therefore asks tourists and other visitors to the area to make themselves aware of the volcanic hazard maps for Nevados de Chillan, to stay informed via the official channels, and to follow any instructions given by the local authorities, which includes (Chilean Civil Defense) ONEMI. Así luce a esta hora el complejo volcánico #NevadosDeChillán que permanece en alerta técnica naranja. If you live in the UK or other countries which have access to BBC iPlayer, just a reminder that Episode 1 of the award-winning tv programme 'Expedition Volcano' will expire at 9 p.m. GMT tonight (17th July). The programme featured a team of international geo-scientists, a medical doctor specializing in tropical diseases, and a former marine soldier (as the safety officer) as they investigated Nyiragongo volcano and its past, current, and potential future impacts on the nearby city of Goma (population: 1 million). The programme also featured members of Goma Volcano Observatory (GVO), a local journalist, former rebel fighters, and the widows of park ranger killed trying to protect the gorillas in nearby forests. Nyiragongo is one of only six volcanoes in the world that has an activity lava lake, and of these, Nyiragongo has the largest. The volcano is unusual in that it has flank eruptions of very low-viscosity (i.e. runny and fast-flowing) lava. During its last eruption the lava flows swept through Goma, destroying buildings and infrastructure, and cutting the city into three. The combined effects of people fleeing the volcanic activity, coupled with civil war in the Democratic Republic of Congo (DRC) and the humanitarian crisis that had spread from across the border from Rwanda lead to poor sanitary conditions and a massive outbreak of cholera, which killed thousands. 'Expedition Volcano' showed not only how the geo-scientists' latest tech ideas could help expand GVO's monitoring capabilities, but how Civil Defense are helping with preparedness for future eruptions with evacuation drills, and how the inhabitants of Goma themselves are showing resilience. From left-right: Aldo Kane (@AldoKane - explorer; rigging; security), Dr Xand van Telleken (@xandvt - medical doctor and tropical disease specialist), Professor Jeff Johnson (@BoiseStateGeos - researcher: volcano seismology and infrasound), Dr Kayla Iacovino (@kaylai - researcher: volcano gas; experimental petrology), Professor Chris Jackson (@seis_matters - researcher: structural geologist). This is the scene when the expedition team reach the summit of Nyiragongo and look down into the crater at the active lava lake. Xand asks the volcanologists if this is just a typical day in the office for them, to which they respond with much glee that, no, this is a pretty spectacular volcano! Professor Chris Jackson abseiling down from the crater's edge of Nyiragongo. In the background we can see the active lava lake and the tents on tier 2 within the crater where Chris and a select handfull of others camped for a couple of nights whilst making observations, taking rock samples, and testing novel ways of additionally monitoring Nyiragongo volcano. I know that you love to look at volcanoes (see below for some great shots), but I personally am equally as fascinated by the sounds that volcanoes make, particularly in using their seismo- (through the ground) and aero-acoustic emission to monitor eruptions. Here we have the first of two examples of some volcano belly rumbles. Either turn up the volume on your computer, or better still, listen to this wearing headphones. ...and here is a second example of some of the sounds made by a volcano, this time at Krakatau, and at a much greater distance away from the volcano than in the previous example. With regards to aero-acoustics, volcanoes emit low-frequency sounds that are below the human level of hearing (infrasound: less than 20 Hz), but which can be detected by animals, e.g. as vibrations via their whiskers (dogs). Low frequency sounds have longer wavelengths, and therefore these sounds travel further than high frequency sounds, which have shorter wavelengths. In the case of Krakatau, the acoustic emissions from this volcano's 1883 eruption were so low, but so loud that they were heard as far away as Australia! A great shot of Mt. Ngauruhoe, aka Mount Doom in 'Lord of the Rings', which is a vent of Mt Tongariro in the Taupo volcanic complex. Ngauruhoe last erupted in 1977, and with the exception of some short-lived, increased counts of seismic activity during three weeks in 2015, has since been relatively 'quiet'. Another fantastic volcano photo, this time taken on a trip to Mount Kelud, which last erupted unexpectedly in 2014. ...and the great fieldwork photos of volcanoes just keep coming. The one (below) of Colima was taken by a volcanology PhD student, who is based at UNAM. A collapse/explosion event occurred yesterday (Sunday 15th July) at 03.26 a.m. local time with energy equivalent to a M5.2 earthquake. The on-going series of collapses of the walls of Halema'uma'u Crater, which then cause the active vent to choke, build up pressure, and explode, are now forming a smaller caldera within the larger Kilauea caldera, is due to subsidence caused by the magma draining out of this part of the system and diverting down the East Rift Zone (ERZ). In the latest image of Kilauea's summit area (above), we can see both how the middle of Halema'uma'u Crater has radically slumped compared to a few months ago, and the coverage of the ash fall from the on-going collapse/explosion events, including over the US Geological Survey's (USGS) Hawaiian Volcano Observatory (HVO) and Jagger Museum (lower, centre) and Ka'u Desert (top, right). Personnel from HVO have been re-located to a building elsewhere, and the Jagger Museum and this part of Hawaii Volcanoes National Park remains closed. HVO report that the seismicity caused by continued downward subsidence is increasing, and they are expecting the next explosion/collapse event to occur sometime today. Sulfur dioxide emissions at the summit area remain low compared to along the Lower ERZ, which is further evidence of the migration of the magma away from the summit area. Below is a link to a time-lapse video of Kilauea's summit area, with one image from every day between 14th April - 11th July 2018. It starts from the time when there was an active lava lake overflowing onto the floor of Halema'uma'u Crater, and then captures the draining of the lava lake and subsequent collapse/explosion events. HVO report that Halema'uma'u Crater is now seven times larger than it was before the start of this subsidence, and that subsidence is occurring at a rate of at least 1 m per day. Lava flows continue to be active along an active perched channel from Fissure 8 in the LERZ, although these flows ceased briefly following the collapse/explosion event at the summit area early yesterday (Sunday 15th July) morning. A channelized a'a lava flow is entering the ocean just west of Kapoho Crater, and has formed a lava delta extending approximately 800m from the former shoreline. It should be noted that not only is this delta unstable and subject to possible collapses, but there are also magma-sea water interactions occurring underwater beyond the visible delta which sight-seeing boats need to be aware of. The chemical reaction between the hot lava and cool sea-water creates secondary hazards, including laze (hydrochloric acid steam), which can cause skin and eye irritation and respiratory problms. In addition, the hot-cold interaction can also result in explosive activity with flying shards of lava fragments and lava sand. The other margins of the lava flows from Fissure 8 were reported yesterday to be approximately only 1 km away from Isaac Hale Park. The Hawaiian Volcano Observatory and staff from other U.S. Geological centres continue to map the flow margins and make other observations, including of cracks forming in the area of Highway 130. This information is then being reported to the Hawaii County Civil Defense, who in turn are monitoring the situation with respect to required road closures and evacuations for local residents. Video from Thursday. Just as the continues earthquakes, also the fissure eruption keeps going. It will probably stop when something important happens at the main crater. How long can this continue? Nobody knows, hours, days, weeks, months even years. let's hope it ends soon for the sake of the people living in the fissure zone. July 12, 2018 Aloha Oe Ahalanui-Kua O Ka La from Mick Kalber on Vimeo. Based on analyses of satellite imagery and model data, the Darwin VAAC reported that on 4 July a diffuse ash plume from Karangetang rose to an altitude of 3 km (10,000 ft) a.s.l. and drifted ENE. The Alert Level remained at 2 (on a scale of 1-4). VMBG reported that during 4-5 July there were four ash-producing events at Anak Krakatau, each lasting between 30 and 41 seconds. Inclement weather conditions prevented an estimation of the ash-plume height from the event at 0522 on 4 July; ash plumes from events at 1409, 1425, and 1651 on 5 July rose 300-500 m above the crater rim and drifted N and NW. The Alert Level remained at 2 (on a scale of 1-4); residents and visitors were warned not to approach the volcano within 1 km of the crater. It has been just over a month since the devastating eruptions at Fuego volcano, which generated pyroclastic density currents (avalanches of hot volcanic gases, ash, and other plume fall-out) and lahars (fast-flowing floods of water, volcanic ash, and other debris). The effects are still very much on-going. The first image is a view looking down Las Lajas Barranca, and shows pyroclastic flow deposits. The two plumes have been caused by collapse of eruption material, assumed to be from the barranca wall. The right-hand side shows (road) RN-14, which has been dug out since it was inundated by the eruption on 3rd June. The second image shows the tail end of a lahar in the Guacalate River. Viewpoint from a bridge just north of Sarita on the RN-14 road. In the Tweet (above), journalist Daniel Guillen Flores shows the national route RN-14 road being excavated after being inundated by volcanic ash and other debris in the 3rd June eruption. Hice una comparación de un antes y un después de Las Lajas, específicamente donde estaba el puente!! This Tweet from Javier Juarez shows a comparison of two sites in the Las Lajars before (left-hand images) and after (right-hand images) PDCs raged through. Statistics from CONRED (Guatemalan civil defense) regarding the 3rd June 2018 eruption of Fuego (@ConredGuatemala). The top half of the poster shows statistics regarding local inhabitants, including the 113 people who died in the eruption and the 332 people who are still reported as missing. The lower half of the poster shows statistics regarding infrastructure, including the effect on roads and bridges, electricity power lines, and schools. Several of our volcanology friends and acquaintances from the UK, Mexico, and Ecuador have just been or still are in Guatemala at the moment assisting their Guatemalan counterparts at INSIVUMEH and (Guatemalan civil defense) CONRED, in particular with mapping the extent of PDCs and lahars as part of the post-eruptive response to aid continuing relief efforts and generate revised volcanic hazard maps. From another image taken by Matthew (see below), we can see approximately how thick the PDC deposits are in some areas by the fact that they almost entirely inundated building. Everything in the village to the right of the image was completely buried. Mount Agung on the far eastern side of the Indonesian island of Bali had a small eruption around 12:50 local time on 6th July. Volcanic ash was emitted, but the eruption plumes were not high. Note that the image above was taken from a distance with a zoom lens. 4,894 local residents self-evacuated as a precaution and went to a refuge point, although this was not necessary this time. By the evening of 6th July the ash emissions had ceased, but a glow was visible at the summit area, which was most likely due to the heat from effusive eruptions of new magma into the crater. By yesterday (7th July 2018), activity was back to 'normal' at Agung. Visitors to Bali are reminded that there is currently a 4 km exclusion zone around Agung. Please do not venture within this. If you are going to the east of the island, as a precaution, take a face mask with you in case of an eruption with ash emissions, and make sure that you are familiar with the updated volcanic hazard map, particularly if you are venturing near a river that leads from Agung, as these may still be prone to lahars in the event of heavy rainfall. In the event of further eruptive activity, passengers should first contact their airline before heading to the airport to check on their flight status. Tourist areas elsewhere on Bali remain unaffected, and all airports, including the international airport on Bali, are operational as normal at the moment. Some great videos are starting to show up on social media of an eruption on 6th July 2018 of Steamboat Geyser, which is one of the biggest geysers in the world. Bear with this video, which is half an hour long, but nicely shows the pre-play phase of the geyser before it fully erupts. During this phase, the geyser system has completely re-charged (with water) and heated to its boiling temperature for this altitude, but the pressure has not been fully released at the surface, and so most of this superheated water remains in its liquid phase. Pre-play is characterised by excess water run-off at the surface and effusive steaming as gas bubbles gently rise to the surface. Eventually more and more steam bubbles rise at a faster rate to the surface, causing a runaway effect, a release of pressure at the top of the geyser conduit, and then a full-on eruption. In the case of Steamboat Geyser there is also a transition from fountain-type activity to more intensive steam jetting, until the geyser's system eventually empties of water and the surface activity ceases as the system starts to re-charge with water and heat up again. PVMBG reported that white plumes were seen rising as high as 100 m above Anak Krakatau during infrequent periods of clear weather from 27 June to 3 July. Incandescence from the summit was observed at night during 1-2 July. The Alert Level remained at 2 (on a scale of 1-4); residents and visitors were warned not to approach the volcano within 1 km of the crater. For the first time since the eruptive crisis at the end of 2017, Mount Agung on the Indonesian island of Bali for a short time this week emitted eruption plumes, which caused some concern. The main activity, featuring thick white emission plumes to elevated heights of around 1.5-2.0 km above the summit area, occurred on 27th and 28th June. The plumes contained small amounts of volcanic ash, which were dispersed in south and south westerly directions. The image below shows ash fall within rain, which was observed by (monitoring agency) PVMBG in Puregai Village around 7 km from the summit area. Communities around Agung and climbers, visitors and tourists were reminded of the 4 km exclusion zone around the volcano's summit, and communities living around rivers in the vicinty of Agung were reminded to be vigilant about the secondary hazard of lahars should there be heavy rainfall. Around 300 inhabitants from hamlets around the volcano temporarily self-evacuated to 3 centres. A VONA (Volcano Observatory Notifivation to Aviation) was issued by PVMBG at 15:01 on 27th June with an Orange Alert, with a follow-up VONA also with an Orange Alert at 08:00 UTC on 28th June. As a precaution, 3 airports were temporarily closed for nearly a day: Ngurah Rai International airport on Bali, and regional airports Blimbing Sari in Banyuwangi and Noto Hadinegoro in Jember. Around 446 flights equating to almost 75,000 passengers were affected (including a friend of ours, a volcanologist, who ironically was on holiday on Bali at the time). Following a decline in the emission plume by yesterday (29th June) afternoon, all three airports were re-opened and are now operating as normal again. The seismic data observed by PVMBG indicates that there were around 5 instances of increased emissions on 27th June lasting between 70-292 seconds, with a main eruption around 22:21 local time. From around 14:00 on 28th June until around 04:00 on 29th June there was continuous tremor, which then sharply declined thereafter. The seismic signals correspond to the emissions plumes observed from Agung, which as of this morning have been weak and effusive. Deformation - inflation, without any deflation phases, of around 5 mm has been observed since 13th May 2018 until now. This is far less than the inflation of 6 cm of uplift which was observed between September-October 2017 upfront of last year's eruptive crisis. Inflation is indicative of increasing pressure from magma (and gases) within a volcanic system. Gas - a flux of around 200 tons of sulfur dioxide (SO2) per day is being measured from Agung. SO2 is indicative of new magma coming up within a system. Satellite imagery - thermal hot spots were observed on the latest images of the summit area captured on 28th June. These were shown to have a maximum thermal energy of around 819 MegaWatts, which is the largest observed since the December 2017 erupative crisis (which was around 97 MegaWatts). The satellite imagery and observations of incandescence (glow) at night time from the summit of Agung are indicative of new, effusive lava within the summit crater. Note that there were some increased emissions also on 13th June, but these were short-lived in comparison to this week's activity at Agung. Mt. Gunung is currently at Alert Level III (standby). For any of you due to visit Bali on holiday, the advice is: take a face mask with you just in case of further activity which may cause respiratory irritation, and check flights before travelling to the airport. Bali is otherwise safe to visit. Mt. Agung is on the east of the island, and is therefore not near most of the tourist areas. Cinder cone island Anak Krakatau, which is one of the four volcanic islands which formed within the 1883 caldera (collapsed volcano) of Krakatau, has been displaying an increase in eruptive activity since 18th June. The activity has been relatively small-scale, and is fine to observe outside of a 1 km (oceanic) exclusion zone around the cone. Anak Krakatau is currently at Alert Level II (stay alert).